Hello everyone hope you all are enjoying your summer it has been busy here with the gardening and outside chores. Today my post is a card that I designed for a great group of ladies that I scrap with. Each month we have a night that is called Playground Night where we take turns coming up with a project to teach. We pay $4.00 for the class and the money is donated to a fund for a playground that was built and named for my son and in turn the money is used for upkeep etc, for “The Matt Pooler Memorial Playground”. 2. Cut off white cardstock 4-1/2″ X 6-1/2″ and emboss each end (4-1/2″ ends) 1-1/4″ in from each edge. 3. Cut green cardstock 4-1/4″ X 5-1/2″ and score at 1/2″ and 2-3/4″ fold on score lines. 4. 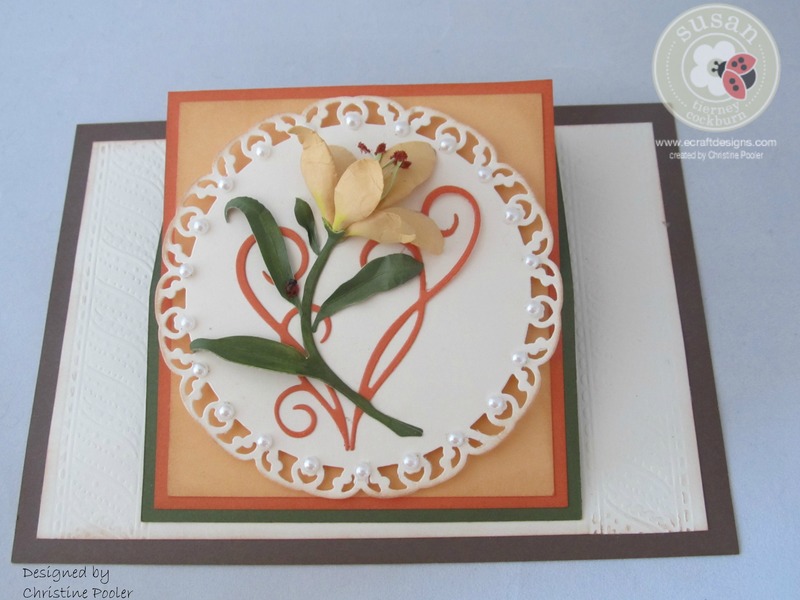 Use removable adhesive on just the outer edges on the back of the off white cardstock and center it on the brown cardstock. 5. Measure up 2-1/2″ from bottom of brown cardstock and center the ECD “Congratulations” stand up helper die and tape in place then run through die cutting machine. Cut away the off white “Congratulations” leaving the brown one as the stand for the card. 6. Remove the off white cardstock and apply double sided permanent adhesive to the back avoiding the cut away area. 7. Apply double sided adhesive to both sides of the 1/2″ flap on the green cardstock. Center the flap of the green cardstock on the off white (6-1/2″ side) attaching the flap to the back side top of the off white cardstock and then attach the off white cardstock to the brown cardstock. 8. Cut sunset cardstock 4″ X 4-1/4″ and the honey cardstock 3-3/4″ X 4″. Adhere the honey piece to the sunset piece using the double sided clear adhesive and then adhere this to the lower 2-1/4″ section of the green cardstock. to center of honey cardstock. 9. Using sunset cardstock and the ECD die cut 2 flourishes. Using a liquid glue and a fine tip add glue to flourishes and attach to circle. 10. 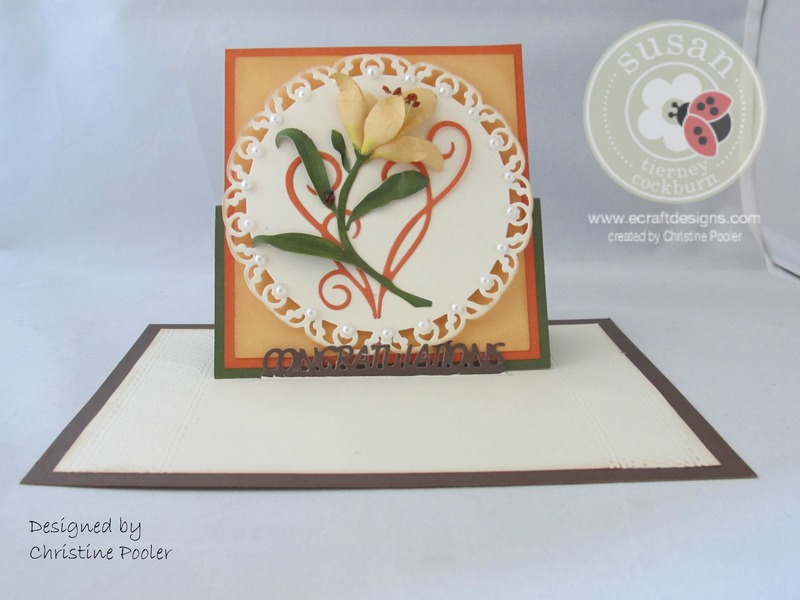 Using Susan’s Garden Lily die cut and shape as seen here. 11. Attach Lily over the flourishes. 12. Add pearls around the outer edge of circle. I do hope this tutorial has inspired you to make this card.